Kumar, C., Jain, P., Wadhwa, N., Diwaker, P., Khan, N. (2017). Nosocomial Jejunal Mucormycosis - an Unusual Cause of Perforation Peritonitis. 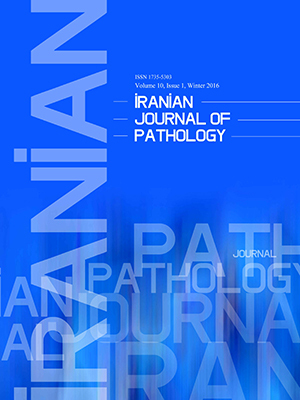 Iranian Journal of Pathology, 12(3), 295-300. Chandan Kumar; Pragya Jain; Neelam Wadhwa; Preeti Diwaker; Nirupma Khan. "Nosocomial Jejunal Mucormycosis - an Unusual Cause of Perforation Peritonitis". Iranian Journal of Pathology, 12, 3, 2017, 295-300. Kumar, C., Jain, P., Wadhwa, N., Diwaker, P., Khan, N. (2017). 'Nosocomial Jejunal Mucormycosis - an Unusual Cause of Perforation Peritonitis', Iranian Journal of Pathology, 12(3), pp. 295-300. Kumar, C., Jain, P., Wadhwa, N., Diwaker, P., Khan, N. Nosocomial Jejunal Mucormycosis - an Unusual Cause of Perforation Peritonitis. Iranian Journal of Pathology, 2017; 12(3): 295-300. Mucormycosis is a rare but highly invasive opportunistic fungal infection. Gastrointestinal disease although uncommon is highly fatal. We report a case of jejunal mucormycosis in a 24 year old undernourished female with preceding surgical intervention for acute intestinal obstruction of tubercular etiology. On 8th post-operative day, she developed oozing from suture line, prompting exploratory laparotomy, bowel resection, jejunostomy and ileal mucus fistula. Resected bowel showed one perforation and several areas of impending perforations. Characteristic broad, pauci-septate hyaline, empty looking hyphae with infrequent branching were found transmurally and showing angio-invasion. Local intestinal tissue trauma coupled with her sub-normal immune status permitted this unusual nosocomial infection. Histopathologic demonstration of the fungus in surgical specimens remains cornerstone of diagnosis of mucormycosis in view of its non-specific symptoms, low isolation rates of mycologic culture and lack of other rapid tests. Mucormycosis of jejunum is rare, but mucosal injury is a known predisposing factor. Mycolgic angioinvasion is responsible for bowel perforation. Histopathology demonstrates characteristic wide fungal hyphae with non-parallel sides. 1. Petrikkos G, Skiada A, Lortholary O, Roilides E, Walsh TJ, Kontoyiannias DP. Epidemiology and clinical manifestations of mucormycosis. Clin Infect Dis. 2012; 54: Suppl 1: S23–34. 2. Roden MM, Zaoutis TE, Buchanan WL, Knudsen TA, Sarkisova TA, Schaufele RL, et al. Epidemiology and outcome of zygomycosis: a review of 929 reported cases. Clin Infect Dis. 2005; 41(5):634–53. 3. Bitar D, Van Cauteren D, Lanternier F, Dannaoui E, Che D, Dromer F, et al. Increasing incidence of zygomycosis (mucormycosis), France, 1997-2006. Emerg Infect Dis. 2009; 15(9): 1395-401. 4. Chakrabarti A, Chatterjee SS, Das A, Panda N, Shivaprakash MR, Kaur A, et al. Invasive zygomycosis in India: experience in a tertiary care hospital. Postgrad Med J. 2009; 85(1009): 573-81. 5. Agha FP, Lee HH, Boland CR, Bradley SF. Mucormycoma of the colon: early diagnosis and successful management. Am J Roentgenol. 1985; 145(4): 739–41. 6. Kwon-Chung K. Taxonomy of fungi causing mucormycosis and entomophthoramycosis (zygomycosis) and nomenclature of the disease: molecular and mycologic perspectives. Clin Infect Dis. 2012; 54 Suppl 1: S8–S15. 7. Rammaert B, Lanternier F, Zahar JR, Dannaoui E, Bougnoux ME, Lecuit M, et al. Healthcare-associated mucormycosis. Clin Infect Dis. 2012; 54 Suppl 1:S44-54. 8. Ribes JA, Vanover-Sams CL, Baker DJ. Zygomycetes in human disease. Clin Microbiol Rev. 2000; 13(2): 236-301. 9. Zaoutis TE, Roilides E, Chiou CC, Buchanan WL, Knudsen TA, Sarkisova TA, et al. Zygomycosis in children: a systematic review and analysis of reported cases. Pediatr Infect Dis J. 2007;26(8): 723-7. 10. Patra S, Vij M, Chirla DK, Kumar N, Samal SC. Unsuspected invasive neonatal gastrointestinal mucormycosis: A clinicopathological study of six cases from a tertiary care hospital. J Indian Assoc Pediatr Surg. 2012; 17(4): 153-6. 11. Maraví-Poma E, Rodríguez-Tudela JL, de Jalón JG, Manrique-Larralde A, Torroba L, Urtasun J, et al. Outbreak of gastric mucormycosis associated with the use of wooden tongue depressors in critically ill patients. Intensive Care Med. 2004; 30(4): 724-8. 12. Karanth M, Taniere P, Barraclough J, Murray JA. A rare presentation of zygomycosis (mucormycosis) and review of the literature. J Clin Pathol. 2005: 58(8): 879-81. 13. Martinello M, Nelson A, Bignold L, Shaw D. "We are what we eat!" Invasive intestinal mucormycosis: A case report and review of the literature. Med Mycol Case Rep. 2012;1(1):52-5.